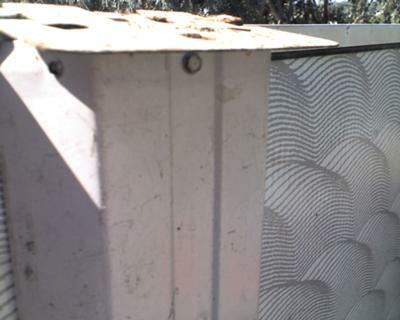 Need a tracker to hold the aluminum or stainless steel outer shell into place at the footing of the pool. Hello, Real knucklehead here. I just purchased a new liner and coping strips for my 15 year old doughboy 48"x 15ft. Thinking I was replacing them, I tossed my top stabilizer rails thinking they were the coping strips I was replacing. Now I've installed the new liner/ coping strips and filled the pool with no way to finish and secure the top edge. Can anyone suggest a solution or have used rails available?? thanks for any input. Need a source for "Tidewater Pool" parts. 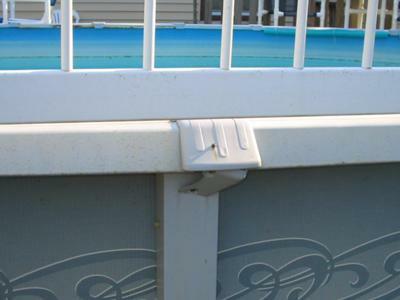 Top rails and top rail caps for a 1995 24 ft round tidewater above ground pool. I believe it was their "Royal Oak" model and the possible model number may have been a 42952. The wall color was rough cedar and came with tan colored top rails. If you are talking about the slotted tubing on top of the coping strips. I wonder if they are really needed. Do they add structural support if not, get some round coping strips. I can't get mine to fit back on. Hi Nampihs. The Doughboy retaining rods are very important. Without them the coping will never stay in place. They also add a lot of stability to the top of the wall. If you could find a heavy duty hose thats about 1/2" or 9/16" O.D. and slit it down one side, I think it would work. 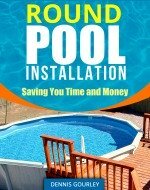 If your pool is round, its more stable anyway than one thats oval. The stability rods on the straight sides of an oval pool don't even link together. Apparently my pool was put together wrong in the beginning because the rods on the straight portion aren't long enough to come up under the caps. While closing our 1992 Aqualine above ground pool I broke off the neck of the return fitting. It contains the eyeball that returns water from the pump and the solar collector through the pool wall to the pool. I am sealed up for winter, but will need a new fitting before opening up next spring. I have a 27ft above ground Tidewater pool. The wall rusted in one area and split yesterday. I would like to find a replacement for this wall and several top rails. Cant seem to get any one to help me with this. The pool is about 15 years old. They seem to have many of the parts for the Delair Group pools. I think mine (been searching for 2 weeks is the same pool as yours) and have been able to find parts on their site. If you can't find a part on their internet site, call their number listed. Very helpful people. :D Best of luck! My above ground top of the side of the pool is rusting. I am trying to find just the top of the sides. I am missing one bottom or top plate, they are the same on my pool. I cannot locate the manufacturer, I purchased it used. 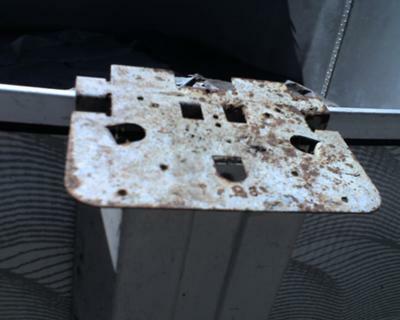 It is a 6 inch by 4.5 inch galvanized steel (heavy steel) plate, with 3 cut out tabs at angles for the vertical side rail, and a lip that goes over either the bottom rim or the top rim. I'll include pictures of the pool and the part. Part number on it says T2989. Thanks for any help! This is keeping me from putting our pool up in record heat here in So. Cal! I have this same pool. I do not know the name of it, but it is manufactured by Delaire. You can go to http://www.bidlist.org/poolboys/index.php and order the part. They will have it. I am trying like mad to identify my pool as well. What I do know is that we have the same exact part number for the bottom support metal plate. best of luck to you. This pool is in fact Delair. It is Tidewater, "Summer Dunes". The bottom and top plates are universal. I would like to ask you if your pool has a top stabilizer rail???? I have the same pool and bought it used. I am still researching. The parts are difficult to find, however, I am getting closer to finding parts and as soon as I do I will come back and let you know. Best of Luck to you Oh, and it was a 2007 series from what I understand. I have a parts list...although cant seem to find where to find replacement parts.if anyone needs info let me know. Mine is a Tidewater Summer Dunes. purchased in 99. I have a 1999 18' diameter Leisure Bay Pool. Looking to replace the top rails, they are getting bent. Any ideas on where I can find them? The recreational warehouse where I bought mine is no longer there. Top rails and other parts for Leisure Bay pools. Hi, I just ordered 17 new top rails for my older 24' above-ground Leisure Bay pool. The pool was made by Cornelius Pools (www.corneliuspools.com), which is now owned by Parent Company "TREVI POOLS" up in Montreal, Canada. The Cornelius Pools website, under Product > Above Ground Pools, has the Installation and Parts manuals for all of the pools they make. I found my pool under the "Round H Hampton + Monaco" link. You can also reach them by phone at 888-777-0447, then ask for Parts Dept. The metal top rails for my pool costs $ 6.34 each; they also have them in resin for $13.25 each. THEY STILL MAKE THESE POOLS, so parts-availability for the rails and any other pieces is not a problem. We have a 1998 Leisure Bay Vintage model Oval Pool that was sold to us as a 15' X 30' X 52" oval pool. 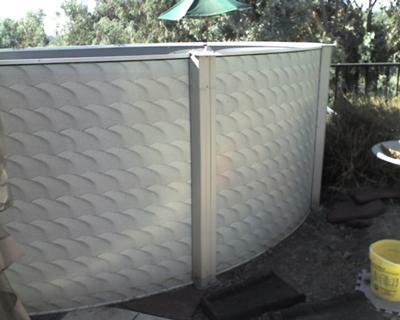 It has a stainless steel end-panel where the sand filter hoses attach to the pool. Our pool has 10 each end top-rails (five on each end of the pool) which measure 58-1/2 inches in length measured in the center of the rails, and it has 10 side top-rails (five each side of the pool) which measure 35-1/8 inches in length measured in the center of the rails. I need 3 each of the 35-1/8 inch side top-rails and 1 each of the 58-1/2 inch end top-rails to replace bent top-rails. Or, will buy a whole set of 20 top-rails is someone has a set. Anyone who can point me in the right direction or sell me Leisure Bay Vintage top-rails is asked to please e-mail me with the information at albarrs@wfeca.net. We have an above ground pool that has wide foam filled walls. We have a Uchannel cap that goes over the wall and sits on top. It also has a track on it for our beaded liner. Our problem is trying to find a replacement because of damage that was done. We have searched everywhere but can not find the kind that is a cap rather than it just going down one side of the wall and getting screwed to the top. Do you have any idea where we can find this type of liner retainer? 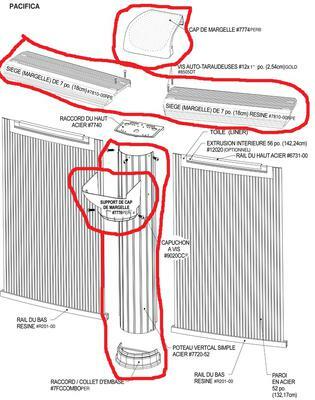 I am needing some replacement parts for an 18ft Pacifica 52 in pool. The pool was purchased in 2005 from Rec Warehouse. I am in need of 1 upright,lower and upper cap and 2 rails. Had a limb fall on it from a storm. Thank you in advance for any help.